....and what's all the fuss about? We'll get to the fuss in a moment. First, here's the low-down. VermaPlex®: An organic specialty fertilizer derived, through a patented process, from certified organic, OMRI listed, pure Black Castings™. This amazing liquid fertilizer, with specially balanced humic acid and plant extracts, helps return soil's balance. 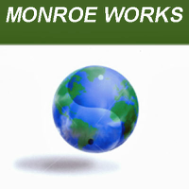 A healthier soil condition encourages beneficial microorganisms. Keep reading and you'll see why this is so important to your soil. Way back "in the good ol' days", all farming and gardening was done "organically". That is, farmers and gardeners used available manures, compost, and vermi-compost as fertilizer. They depended on microbes in the soil to process the organic materials and slowly release the nutrients for the plants. Back then, the soils were teaming with these microbes, filled with organic material, and loaded with micro-nutrients. As cheap chemical fertilizers became readily available, as farming became more mechanized, and as folks looked for fertilizing "quick fixes", the soil conditions quickly deteriorated. What we're left with is basically dead soil. "Back then, the soils were teaming with these microbes, filled with organic material, and loaded with micro-nutrients." Today, most of us are coming to realize that this soil destruction cannot continue. More and more of us are returning to organic methods of gardening and focusing on improving our soil - in bringing it back to life. VermaPlex® can help achieve this goal by returning soil to it's original healthy balance. A balanced, healthy soil can encourage microbial diversity. By adding organic content in the form of compost, vermi-compost, or worm castings, soil can be transformed back to its original condition nature intended. Neamatodes are eradicated through "competitive exclusion"
As a part of your return to organic gardening methods, start using VermaPlex® today. What Are The Results of Using VermaPlex®? VermaPlex® is completely safe to use around pets and children. 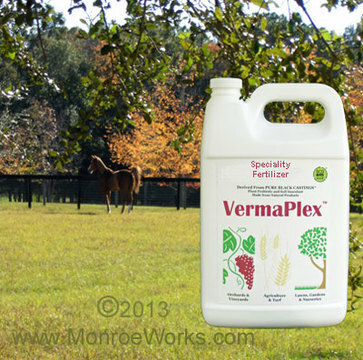 VermaPlex® is concentrated - a little goes a long way. One gallon of VermaPlex® equals 20 gallons + of solution. You can use it as a foliar feed or drench. Apply VermaPlex® (after adding Black Castings™) to your garden, plants, flowers and start seeing amazing results, organically. Got a problem plant? Try an economical quart size today. You'll see results in a very short time. 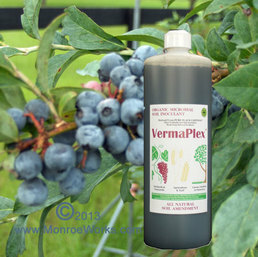 Gallon and bulk quantities of VermaPlex® are also available.